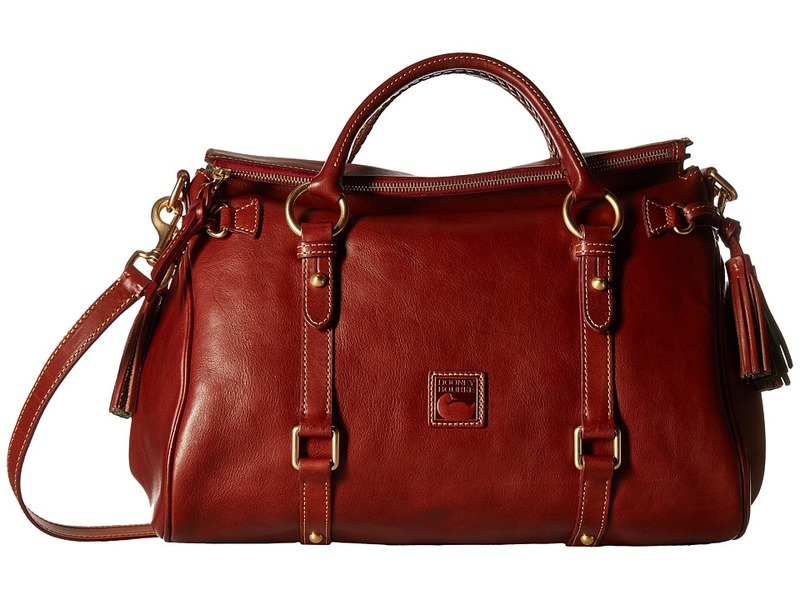 Go beyond the trends by reinventing your wardrobe with this distinct Dooney Bourke satchel! Convertible handbag made of supersoft leather. Top zip closure. Dual handles with a removable crossbody strap for versatile carrying. Contrast stitch detail adds a pop of color. Decorative hardware accents. Flat bottom with protective metal feet. Lined interior features a back-wall zip pocket, slip pockets and a key fob. Imported. Measurements: Bottom Width: 15 1 2 in Depth: 6 1 2 in Height: 13 in Strap Length: 45 1 2 in Strap Drop: 21 in Handle Length: 12 in Handle Drop: 3 1 2 in Weight: 3 lbs 7 oz Please note, the hardware color and interior lining may differ from the color shown in the photo.